Whether you’re a professional seamstress who creates apparel for your clients, you’re an experienced sewer who loves pulling out your sewing machine to make drapery and other one of a kind home décor items, or you are a novice who dabbles with the basics, like sewing a seam or taking up hems but you want to up your game and start working on some more intricate projects (with the guidance of a little sewing help, you’ll be surprised by how much you can learn! ), it’s likely that you’re going to work with piping trim at some point. Piping adds more interest and adds the finishing touches to all types of projects. For example, it can make a plane Jane and otherwise ho-hum coverlet made out of pre-cut quilt squares and quilting batting look like a masterpiece, or it can turn a basic garment made out of a generic sewing pattern into designer duds. There are so many ways to use sewing piping trim, which is why a lot of crafters – both professional and hobbyists – say that it is one of the sewing essentials that all seamstresses should familiarize themselves with. But trying to create your one piping trim can be a bit of a challenge; especially if you’re new to the craft. Even if you’re an expert, it can be hard to find the time to make your own piping. But if you aren’t an expert or you just don’t have a lot of time, that doesn’t mean you have to forego this beautiful technique. By having some pre-made piping trim on-hand, you can quickly and easily add this lovely detail to your projects. Like sewing fabric, hand sewing needles, and marking tools, fabricated piping trim is definitely a supply that you should keep a stock of in your sewing room. But, like all other types of supplies, there are so many different types of trims to choose from. To help you find the best options, we’ve taken the liberty of conducting some research and testing out different types of piping trim. We’ve narrowed down the seemingly endless options to what we consider to be the top five fabric piping currently on the market. Now that you’ve seen our top five choices for the best piping fabric, let’s take a closer look at each one. Below, we provide a more in-depth overview of each of cloth piping. In our reviews, we highlight the features of each item, discuss what we like about them, and share what other customers who have used these products have had to say about them. After you finish reading the reviews and decide on an option that you think will best suit your needs, click on the yellow link to find the best prices currently available on Amazon. 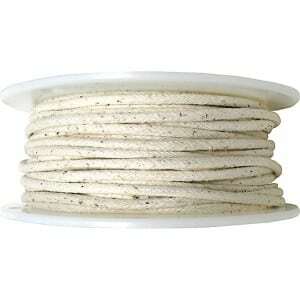 The first piping thread on our list is Wrights 183 9001-29A Cotton Piping. Made of 100 percent cotton, this piping thread is very durable and offers just the right amount of stiffness, yet it’s also somewhat flexible, so you can easily adjust the layout to suit the specific shape of whatever project you are working on. You’ll receive a spool of 50 yards of piping thread, which should last you a while or be enough to get a good bit of your projects completed. The diameter of the thread is ¼ of an inch, which is the perfect size for pillows, blankets, quilts, and clothing. It can even be used around the edges of appliqués and decorative patches to really make them pop. And, since the color of the cord is natural, it will blend in nicely with virtually any type of fabric. From our observations, this piping trim is really easy to work with; however, we did note that because due to its flexibility (which is great for a lot of projects), it may not be well-suited for projects where you want a stiff edging, like covers for couch cushions. Nevertheless, we were very impressed with this product, and based on the reviews that we read, most of the customers who have used it are happy, as well. Final Verdict: Overall, we were very impressed with Wrights 183 9001-29A Cotton Piping. It’s an easy to use piping trim that sewers of all skill levels can use for a wide variety of projects. 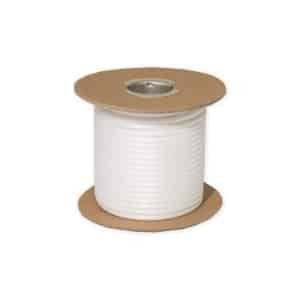 If you enjoy making your own slip covers, pillows, or draperies, and you are looking to add some dimension and interest to your upholstery fabric, this Polyester Welt Cord Cellulose Piping from the Sofa Source is a must. It features a polymeric core that is encased in a uniform braided cellulose material, which means that the piping is extremely durable. It has a medium-firm welt, so it’s firm enough to maintain its shape, yet malleable enough to bend around curves, giving whatever project you are working on a finished, professional look. 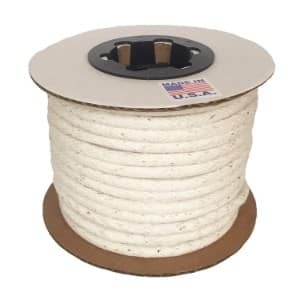 The spool is wrapped with 50 yards of piping, and the thickness of the material is 5/32 of an inch, which is the thickness that is most often used in upholstery projects. And it’s not just the piping that’s durable; the spool is, too. It’s made of chip board, so it will retain its shape and it will be easy to work with from one project to the next. Based on our observations, this piping thread is extremely well made, durable, and easy to use. We actually couldn’t find any! Final Verdict: If you’re looking to embellish upholstery, pillows, draperies, or any other project, this Polyester Welt Cord Cellulose Piping from The Sofa Source is an excellent choice. We were so impressed with the above-mentioned piping fabric that we decided to include another version of it on our list! This option is exactly the same as the Sofa Store’s Polyester Welt Cord Cellulose Piping described above, but the only difference is that instead of being 50 yards long, this option is 25 yards long. It has the same polymeric core wrapped with braided cellulose construction, and it is also 5/32 inch thick, which, again, is the same thickness that is most often used in upholstery projects. If it’s the same product, why did we decide to feature it again on our list of the best sewing piping trim? Honestly, it’s because of the shorter length. Some crafters may not need 50 yards of trim, and we wanted to let those of you who need less know that there is a 25 yard option of the same durable piping trim available. The medium-firmness of the welt allows the trim to hold its shape in whatever application you are using it for, yet it’s flexible enough to bend around curves. Since it’s white, it works with fabrics of all colors, and since it’s wrapped with braided polyester cellulose, it can be used with all types of materials, from velvet and vinyl, to canvas and duck. 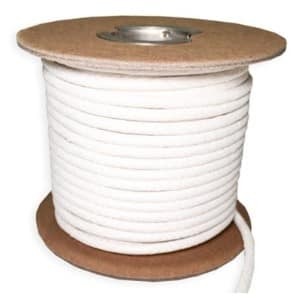 This Cordage Cotton Piping Welt Cord from Great Lakes is professional grade, so you know that it is durable and that it will add that finished look that you are trying to achieve. This piping is extremely smooth, which means that it is super easy to work with; in fact, of all the piping trims we sampled, this is one of the easiest that we used. This trim is ¼ inch wide, which is the perfect width for a wide variety of projects, such as pillows and soft welt applications. The filler is made of 100 percent cotton and is wrapped with polyester braid. It’s easy to wash and will most certainly withstand wear and tear. The neutral color is perfect for all types and colors of fabrics. We also like that it is wrapped around the spool in one continuous piece, so your projects won’t be derailed by splicing. Final Verdict: We were very impressed by how easy this piping trim is to work with and how durable it is. However, do make sure that you take note of the dimensions before you order. 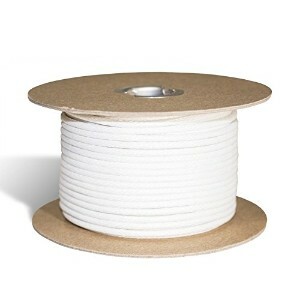 Finally, the last piping trim featured on our list is Wholesale Upholstery Supply’s Polyurethane Foam Welt Cord Piping. This piping is 5/32 inches thick, which is the size that is most commonly used in upholstery applications, so it’s ideal for slip covers, pillows, and other types of upholstery projects. Since it’s made of polyurethane, it can be used for outdoor applications, like slip covers for the seats on a boat or for outdoor patio cushions. It’s mold and mildew resistant, and can withstand extreme wear and tear. The welt is semi-firm, which means that it will easily maintain its shape and create that finished look you are looking for. We found that it was pretty easy to work with; however, because it is a semi-firm welt, it does take a bit of effort to wrap it around curves. Nevertheless, we were very pleased with the product, as were the majority of the customers who have used it. Final Verdict: If you’re looking to create outdoor upholstery, Wholesale Upholstery Supply Polyurethane Foam Welt Cord Piping is a fantastic option to consider. It’s mold and mildew resistant and is made specifically for outdoor applications. 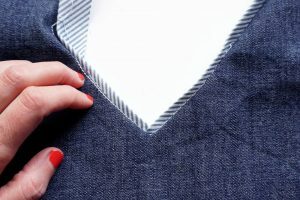 There are so many different techniques that are used in sewing, and adding piping trim is one technique that you should definitely familiarize yourself with. It adds the finishing touch to all types of projects, from clothing to upholstery, and more! It instantly makes a DIY project look like something that was professionally made. Traditionally, piping trim is handmade. While that technique is certainly still used today, the fact of the matter is that it can be very time consuming to create. It also requires a lot of patience, a keen eye, precise measurements, and a very steady hand to get it just right. However, thanks to fabricated piping trim, you can forego all the extra work and still get that beautiful, finished look that you want to achieve. Piping trim can be used to add dimension to sofa pillows and cushions; it can add interest to garments, and it can even be used to make an appliqué stand out even more! To select the best piping trim, we enlisted the help of avid sewers; both professionals and hobbyists. We sampled dozens of piping trim products and tested their durability, their ease of use, and their ability to maintain their shape. Based on our assessments, we were able to narrow down the options to the five products featured on our list. Needless to say, we were very impressed with these products. We are confident that if you use any of these piping trims, you will also be very pleased with the results.